When NASA thrusters are mentioned, most people imagine something like the breathtaking launch of the Saturn V rocket that sent astronauts to the Moon. Its five enormous F-1 engines generated more power than 85 Hoover Dams, and liftoff shook tiles off the ceiling of the observation room three miles away. But the agency that is currently topping that feat with its coming Space Launch System, planned to be the most powerful rocket ever built, is also now demonstrating the most delicate thrusters ever flown, so gentle they max out at a thrust equal to the weight of a fine grain of sand. When engineer John Ziemer joined NASA’s Jet Propulsion Laboratory in 2000, one of his first projects was to survey possible thruster technology for a disturbance reduction system (DRS) that was to be NASA’s contribution to the European Space Agency’s (ESA) Laser Interferometer Space Antenna, or LISA, Pathfinder mission. The mission is to demonstrate technology that could one day enable measurements of gravitational waves in space. Following its development of extremely precise, delicate, and efficient electrospray thrusters for the disturbance reduction system NASA provided for the European Space Union Laser Interferometer Space Antenna, or LISA, Pathfinder spacecraft, Busek designed a similar thruster for use in nanosatellites, which have tight space constraints. The DRS would also have to be unusually long-lived. Normally, thrusters are used only occasionally and briefly to put a spacecraft in place or change trajectory. But because the DRS must allow the craft to perfectly follow the test mass floating at its center, it has to be running whenever testing is being performed. Accordingly, the mission requires thrusters with a life of up to 3,000 hours. 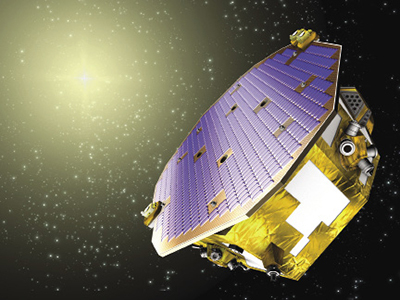 NASA’s contribution to LISA Pathfinder was funded as Space Technology 7 (ST7) under the Agency’s New Millennium Program, which works to put the latest technology to the test in space. During the buildup to the project, Busek, a company specializing in spacecraft propulsion and located in Natick, Massachusetts, was working on developing thrusters for use on nanosatellites under a Small Business Innovation Research (SBIR) contract it had won from Glenn Research Center two years earlier. As ST7 got underway and Ziemer became the project’s cognizant engineer for thrusters, Busek was one of two companies selected to compete for the contract to supply the subtlest thrusters ever flown: a technology called electrospray. “There really isn’t anything that can compete with electrospray, in terms of thrust efficiency,” says Nate Demmons, director of Busek’s Electrospray Group. It works by applying an electrostatic field to the surface of an ionized, conductive liquid such as a molten salt, he explains. The charge distorts the surface into what’s known as a Taylor cone. At a certain voltage threshold, the electrostatic field overcomes the liquid’s surface tension, and a fine spray is ejected from the tip of the cone. These tiny droplets are then electrostatically accelerated to increase the thruster’s power. Having a negligible vapor pressure, Demmons explains, ionic liquids don’t evaporate in the vacuum of space, as most fluids would. It was the discovery of these liquids in the 1990s, which have the right surface tension, viscosity, and conductivity, that led to a “Renaissance in electrospray,” he says. The force of the spray, however, still is not easy to control, Ziemer says, noting the ESA worked for about a decade to master electrospray for the LISA project before ultimately switching to a precision cold-gas thruster system to meet budget and schedule constraints. As part of NASA’s Space Technology 7 project, Busek developed electrospray thrusters that max out at the weight of a fine grain of sand for the disturbance reduction system on the European Space Agency’s LISA Pathfinder spacecraft. The craft is trying out technology that could be used in the future to detect gravity waves, which are predicted by the theory of relativity but have never been directly observed. Busek refined its control of the thrusters’ delicate touch by developing a piezoelectric valve that manages the propellant flow rate. The behavior of such a thruster is difficult to observe or characterize, as the droplets it produces may be smaller than a wavelength of visible light, making them literally invisible. “Regardless, if you can control the voltage and current very closely, you can control the thrust,” says Ziemer, adding that the energy output can then be predicted down to the number of atoms that will be accelerated. “Busek showed that, with the extra valve, they could not only meet the long-life requirement but also meet the thrust requirements,” he continues. Busek was selected to supply two clusters of four thrusters each for the ST7-DRS project, which the company delivered in 2008. The craft was finally launched in 2015, marking the first time electrospray thrusters were flown in space. The thrusters the company had developed under the contract were capable of thrusts of up to just 30 micronewtons—about equivalent to the weight of the aforementioned mosquito. Busek has since scaled up the technology and returned to the original intent of its work with Glenn—providing propulsion for nanosatellites, such as the increasingly popular CubeSats. 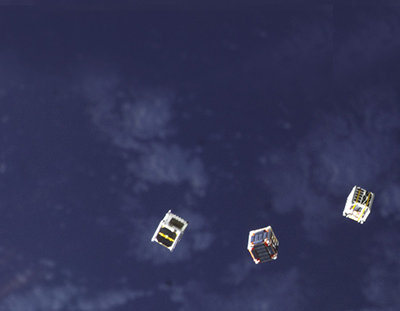 These inexpensive little satellites are now used by Government agencies, companies, universities, and hobbyists for purposes like Earth imaging or carrying out experiments in space. There are, however, virtually no options for on-board propulsion that meet the tight volume constraints of these tiny spacecraft, leaving them unable to change orbit or control how quickly their orbits decay. Busek has successfully produced 100-micronewton and 1-millinewton electrospray thrusters for use on CubeSats, as it works its way up to a 20-millinewton booster that would be required to alter a small satellite’s orbit. This is about the force generated by other electronic propulsion systems at their lowest power. Since delivering its electrospray thrusters to the Jet Propulsion Laboratory in 2008, Busek has added a similar propulsion technology to its line of thrusters available for use on nanosatellites such as CubeSats, which, at 10 centimeters across, have tight space constraints. More traditional ion thrusters operate at about 50 to 60 percent efficiency, meaning only a little more than half the power used to run them is converted to thrust, due to the energy spent generating, containing, and managing the ionized plasma that propels them. Meanwhile, the electrospray system Busek built for the LISA Pathfinder operates at about 70 percent efficiency. There are also other applications for aspects of the technology. 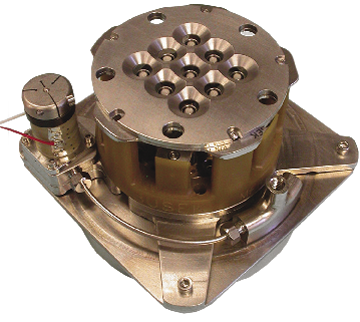 For example, Busek has sold the carbon nanotube electrostatic field emitters it designed for the electrospray thrusters to universities for uses such as electron microscopy. The firm is actively exploring applications within the semi-conductor manufacturing field as well. The company is most interested in opportunities to get its CubeSat electrospray thrusters into space. Although no units have yet flown, a government or commercial client willing to take on some risk could partner with Busek to make it happen. There are several other options for satellite manufacturers, however. Busek has developed and now offers several thrusters, including Hall effect thrusters, micro- pulsed plasma thrusters, radio-frequency ion thrusters, and green monopropellant thrusters—most of which were developed with at least some NASA funding. None, however, enable the extreme micro-precision Busek developed during the LISA Pathfinder mission—a mission expected to open up a new way to observe the universe, from unveiling mysteries in the planet’s crust and ocean currents to spotting events billions of light- years away.